The plan was to bake a sea salt caramel cheesecake. 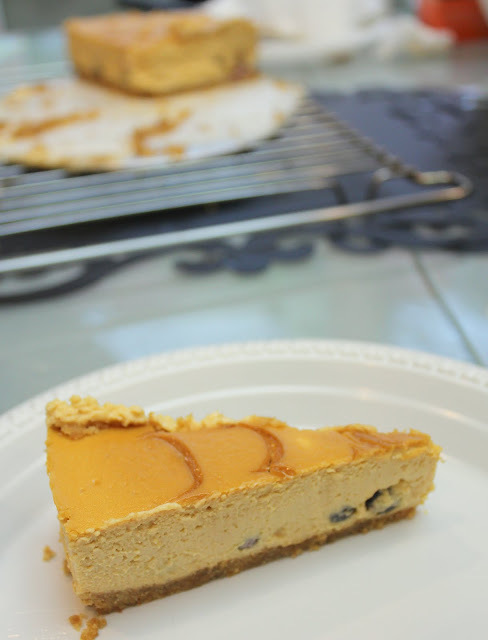 But due to a turn of events, we scrapped the original idea and made a caramel blueberry cheesecake instead. Given more preparation time I would much prefer to have some blueberry swirls inside the cheesecake, or a thicker caramel swirl. A sticky, gooey texture would be a great pairing with the smooth cheesecake in my opinion. Overall it was a great recipe with hardly any hiccups. No cracks encountered despite it being (for most of us) our first time making it and all the rough handling. Just be sure to give it loads of time to cool. Leave it outside for a good 3 hours before throwing it into the fridge. To shorten the cooling, leave it in the freezer instead of the fridge. The cheesecake needs a lot of time to set. We following this recipe. Step by Step instructions with photos. 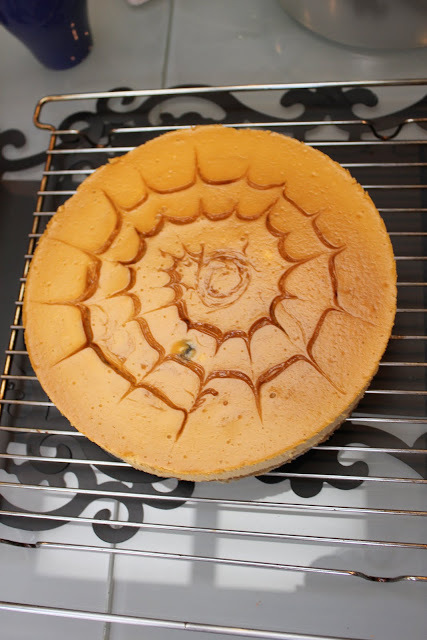 To do the spiderweb use the leftover caramel to make a giant swirl and slide a toothpick outwards from the centre of the swirl.